We had fun trying out different types of crafts during the December holidays. 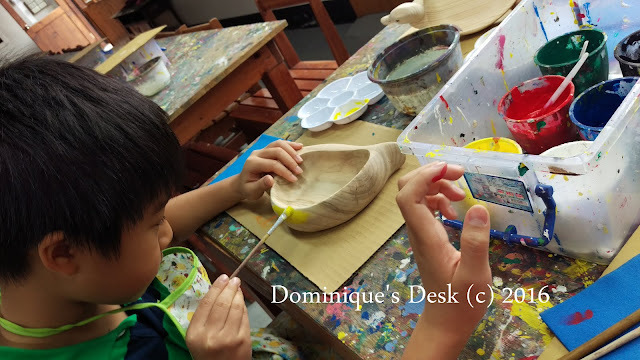 One activity which the kids and I tried was painting on wood. Ducks and woodwork are the main attraction in Miaoli. We were taken to a Duck DIY workshop during one of the day trips in Miaoli, Taiwan. Each of us chose the wooden item which we would like to paint on. Tiger girl chose the horse above to paint. We were give a pallet , blotting paper and paint brush and were off to do our painting. 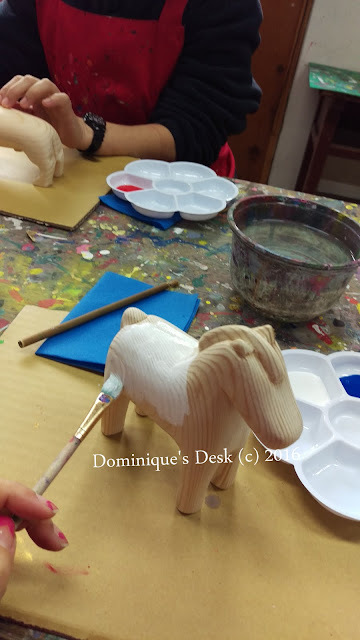 Painting a wooden figurine was not as easy as we thought. It requires several coats of paint and drying in between to get the perfect finish. We were given pots of colored paint which had their consistency pre-mixed. The kids were to scoop out the amounts that they require to put on their palettes and mix the colors if needed. The workshop was held in a traditional looking classroom with wooden benches and tables. The kids had to use the hairdryer to dry their wooden statues after each new coat of paint has been added on. This is to ensure that the statue would have a smooth finish when it goes through the furnace in the end. It took about 2 hours before their masterpieces were completed and ready for the furnace. There is time for ice-cream anytime while on holidays. 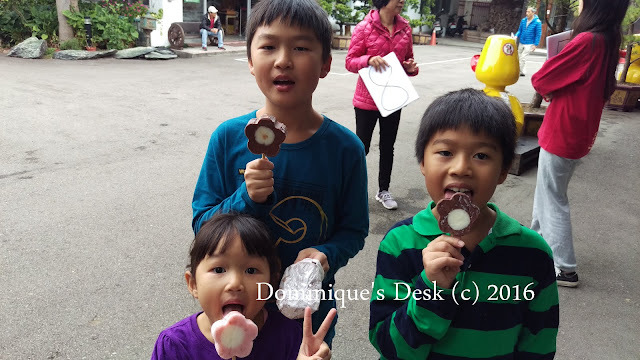 The kids enjoyed their flower shaped ice-cream after they completed their crafts. Have you painted on wood before? Yes and no. We tried painting wood with acrylic which is pretty easy. It does not require layers of paint and does not go through a furnace. It’s very different from what you have blogged. Yours is a more professional finished look. Great job! Do you have any idea what kind of paint is being used? What a fun craft. The wood looks more like horses than ducks. I haven’t painted on wood unless you count furniture ; ) Good project for the kids! Nice family bonding. I’m sure my son will like this but too bad we don’t have that workshop here in our place. Painting is one activity that all kids enjoy and it’s really fun to do it with them as well! What an awesome experience this was for you and your family! Great work, kids!! I’m sure it was fun fiddling with paints and brushes! It looks like a wonderful project! I didn’t know that you could fire wooden objects. I always thought the furnace was for pottery. How interesting! I hope you share photos of the end results! Happy 2016 to you and your family! Fun! You always do such interesting things with your kids. No but I enjoyed the pictures of your children painting wood! Have a great week. I’ve never painted on wood before. It looks like something to try when the kiddos are older. Thank you for sharing! My daughter likes artsy activities like this. I hope I can find something like this workshop here. Painting wood is really great, it helps to develop their motor skills.. And the kids for sure they will enjoy and like painting. Yes. I tried wood painting and it’s true that it requires layers of paint after several minutes if drying, painting and drying again. Time consuming though, but the result is worth it. Uhm, not yet, but would love to try too if there’s a chance. My son also loves painting. So cute! I don’t remember painting on woods before. It would have been so fun if I’ve tried. Your kids are adorable Dom.